PRX’s Project Catapult is an innovative podcast training program rooted in the principles and practice of design thinking. With generous support from CPB, seven podcast teams from public radio stations across the country were selected for the inaugural training, which kicked off in January 2017. We aimed to help the teams iterate podcast prototypes, grow their podcast audiences and serve their stations’ missions. Round one of Project Catapult ends this month, and planning for a second round is underway. Often described as the audio version of Humans of New York, Out of the Blocks uses an immersive and artful approach to storytelling. 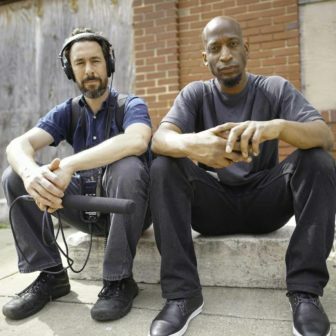 Producers Aaron Henkin and Wendel Patrick visit a city block with the goal to capture stories from every resident they encounter. In 2017, Out of the Blocks was able to expand its storytelling beyond Baltimore, capturing and sharing stories from Seattle, Detroit and St. Louis. Aaron Henkin, Out of the Blocks: Design thinking is a process used to find solutions to problems, starting from a place of empathy. This had been a fascinating but abstract academic concept to us. We had never had an opportunity to apply it to anything that mattered. 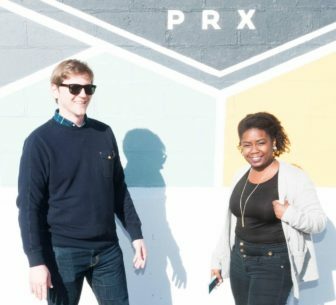 We found the training invaluable and adapted it to use with our fellow producers at WYPR to encourage them to build up our station’s menu of local podcasts. WYPR has some great new homegrown programming as a result, including The Noir & Bizarre, (a podcast about occult history, ghosts, haunted houses and secret crimes; and Knock Knock Who’s There, a curiosity-driven podcast that literally knocks on doors to find out who and what is on the other side. Tim Lloyd and Kameel Stanley, We Live Here: Before Project Catapult, we had no real understanding of design thinking. The first we heard of it was on a call with PRX when they were considering our application. Since then, it’s become something of a revelation for us. The concept of empathy, the way it’s used in design thinking, is especially powerful. It didn’t make us more creative as people, but it gave us a way to funnel that creativity toward serving an audience. Prior to Catapult, we viewed our work as something that was consumed by a general audience. In fact, if you asked us, we probably couldn’t tell you who listened or who would want to listen. After learning design thinking, we were forced to define a specific audience and figure out who we would cater to. In our case, we picked two personas: people of color who are steeped in issues of race, class and discrimination and are looking to feel validated and connected, and white people who want to understand how race and class affect real people’s lives. Design thinking has also changed our workflow completely. We learned about “flares,” a method for quickly conducting focused brainstorms. We got comfortable prototyping audio and incorporating feedback from multiple sources while we’re putting episodes together, instead of just at the end of a project. And, we bought a whiteboard and use a lot more sticky notes now. Lloyd and Stanley: Part of the appeal of Project Catapult was time. Often public radio stations begin podcasts as an experiment or a side project, which can lead to a misunderstanding that a podcast can be produced in a similar way as a broadcast news segment or feature. In reality, all of us in Project Catapult can testify that a podcast is a different animal from a longer broadcast piece. While we met initial success with our show, we discovered that lack of time to fully immerse ourselves in the show prevented us from thinking about how to move to the next level. Henkin: When you’re constantly on deadline to publish your next episode, there’s very little time to zoom out and reflect on your goals and methods. You’re just constantly crunching to get that next episode out. Project Catapult allowed us to hit pause on the day-to-day grind to think about how and why we were doing what we were doing. It also introduced us to a regimen of purposeful feedback from our peers and mentors, and it taught us how to filter that feedback and use it wisely. Lloyd and Stanley: Based on our experiences in public radio, there isn’t a built-up culture of original programming at many stations. Most original material is produced to fill preset broadcast holes in national programming. For example, sometimes four-minute features can sound similar: Start with a scene, nut graf at about 45 seconds, go to an expert or the other side of a contentious issue, closing thought or circle back to original scene. But the digital space is so different. Removing time limits and knowing that an audience member specifically chose your content amid a sea of options gives producers a chance to experiment with different structures and formats that might be jarring on a more traditional broadcast platform. And in many ways, the role of gatekeeper has been democratized. Users want content that reflects their worldviews and are savvy that those perspectives are beyond those of the older, whiter audience public radio has traditionally catered to. People also have many choices, which makes it more important for producers to be intentional about grabbing and keeping listeners’ attention. Henkin: As radio people, we were slowly coming around to a notion that our tech-savvy colleagues already saw clearly: Our radio program could have more reach and impact as a podcast because it can be heard beyond radio. Podcast listeners are also self-selecting. You don’t “happen to hear” a podcast in the same way you “happen to hear” a show on the radio. It’s a different, more intentional relationship, and as producers, we need to treat it as such. Lloyd and Stanley: Project Catapult gave us a sense for what creativity and serving an audience looks like in the digital world. For us, at a mid-market public radio station, we have to be really focused on whom a podcast serves first. If other people listen, that is terrific. But the only way we think we can bring lots of people to the table is knowing who is at the front of our line, making something they like and hoping they tell all their friends about us. Henkin: Local public radio listeners cherish quality local content. We’re a podcast, which means theoretically anyone can click and listen, but we’re aware that our audience, for the most part, is nearby and very connected with our city. Lucky for us, though, this city is full of people who tell powerful and universally human stories. And our production techniques and original musical scoring bring more listeners into the fold, even if they’re not initially interested in voices from the streets of Baltimore. Henkin: We’ve made some very tangible progress. We’re posting episodes of Out of the Blocks every two weeks now, which was inconceivable to us a year ago. It used to take us eight weeks to produce one episode. Project Catapult helped us realize that we could publish shorter episodes by dividing our blocks into multiple parts, which lets us put more frequent content into our feed. And our audience has grown 33 percent since June 2017. Most importantly, though, we’ve learned to think of what we’re doing as an ongoing experiment. Now, we’re not just willing to adapt and evolve; we’re aiming to adapt and evolve. Lloyd and Stanley: Take chances and be willing to rethink everything from tone to marketing. On-demand is your chance to take what you’ve spent decades getting good at — telling vivid and important stories with audio — to build new connective tissue with the public that can help sustain your mission. More than anything else, the longtime talk show host’s career has been dedicated to dismantling the racial divides that structure the city and its airwaves.